More news from Burgess as they bring word of a joint central agency for sale, with Bruce Brakenhoff Jr at Perini Navi USA, on the 56m sailing yacht Salute. Styled by Ron Holland and Perini Navi and built to ABS class in 2008, Salute is an evolution of the highly acclaimed Perini Navi 56m series, with a sloop rig, 732 mast, forward facing cockpit and a chic Remi Tessier interior with strong Japanese influences. MCA classed, Salute accommodates up to 12 guests in four sumptuous staterooms and two twin cabins while twin 965hp MTU engines give her a range 0f 4,750 nautical miles at 12.5 knots. 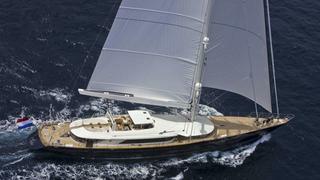 She was voted best sailing yacht over 45 metres at the 2009 World Superyacht Awards. Boasting an impressive charter record, Salute is asking $35 million.